The primitive streak is a grooved structure that forms on day 15 of human development, along the caudal midline of the bilaminar embryonic disc and is the first visible sign of gastrulation. At the cranial end of the primitive streak, an expansion marks the location of the primitive node. Cells in the midline ridge of the epiblast ingress through the primitive streak and first form the definitive endoderm and then the mesoderm, a layer that lies in between the epiblast (now called ectoderm) and endoderm layers. 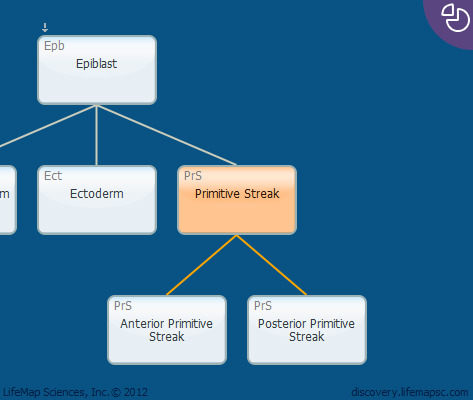 The endoderm forms during the early primitive streak stage. The midprimitive streak stage includes the formation of the prospective notochord, manifested by formation of the notochordal process, as well as the head mesoderm, somites and the intermediate, lateral plate and paraxial mesoderms. At the fully elongated primitive streak stage (maximal streak length), no further epiblast migration into the streak occurs and the remaining epiblast is called ectoderm. The streak then regresses.